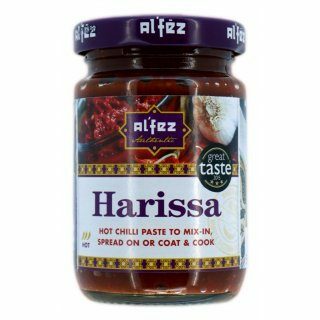 Our Harissa is a smooth, aromatic paste made with Chilli, Tomato and Garlic and is ready to use. Mix a little into Couscous or Rice for an extra kick or add to Mayonnaise to make a delicious spicy dip. Create a tasty marinade for meat or vegetables by combining Harissa with Honey and marinating in the refrigerator for at least an hour before cooking. Ingredients: Water, Tomato Puree (14%), Pimentos (10%), Salt, Garlic (3%), Cayenne Pepper, Sugar, Crushed Chillies (3%), White Wine Vinegar, Vegetable Oil, Lime Juice concentrate, Aniseed, Cumin, Coriander, Olive Oil, Acidity Regulator: Citric Acid.